One of the many subjects that I have pondered upon in the last few years is the role of education and whether a learning of our thousands of years old human culture of pathei-mathos – understood and appreciated as a distinct culture , and thence as an academic subject – could possibly aid us, as a species, to change; aid us to become more honourable, more compassionate, less egoistical, less violent, as individuals, and thus aid us to possibly avoid in our own lives those hubriatic errors, and causing the suffering, that the culture of pathei-mathos reveals are not only unethical but also which we humans make and cause and have made and caused again and again and again. That is, can a knowledge and appreciation of this culture, perhaps learnt individually and/or in institutions such as schools and colleges, provide with us with that empathic, supra-personal, perspective which I personally – as a result of my own learning and experiences – am inclined to feel could change, evolve, us not only as individuals but as a species? For thousands of years – from the classical world to the Renaissance to fairly recent times – Studia Humanitatis (an appreciation and understanding of our φύσις as human beings) was considered to be the basis of a good, a sound, education. Furthermore, this paganus natural balance implied an acceptance by the individual of certain communal responsibilities and duties; of such responsibilities and duties, and their cultivation, as a natural and necessary part of our existence as mortals. 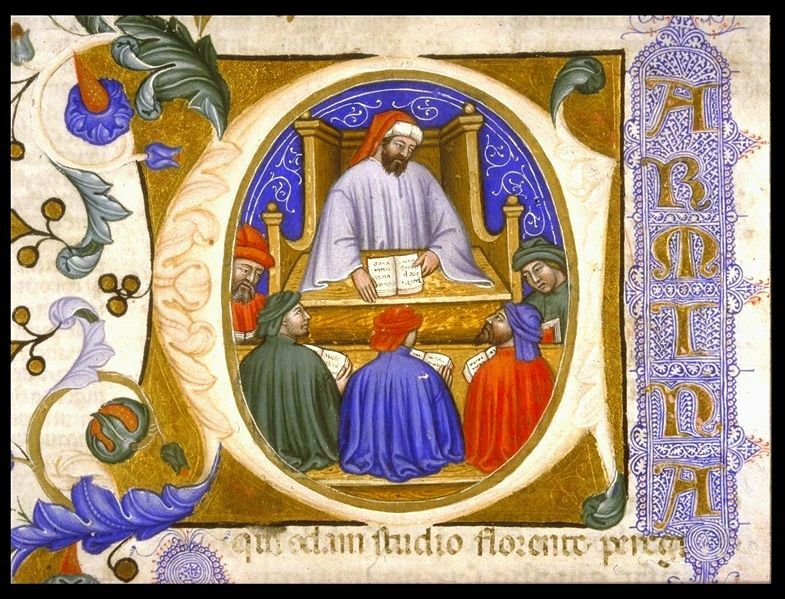 In the Christian societies of Renaissance Europe, Studia Humanitatis became more limited, to subjects such as history, moral philosophy, poetry, certain classical authors, and Christian writers such as Augustine and Jerome, with the general intent being a self improvement with the important proviso that this concentration on the advancement of the individual to ‘noble living’ by means of ‘noble examples’ (classical and Christian) should not conflict with the Christian weltanschauung  and its perceiveration of obedience to whatever interpretation of Christian faith and eschatology the individual favoured or believed in. In more recent times, Studia Humanitatis has become the academic study of ‘the liberal arts’, the ‘humanities’, often as a means to equip an individual with certain personal skills – such as the ability to communicate effectively and to rationally analyse problems – which might be professionally useful in later life. However, the culture of pathei-mathos provides an addition to the aforementioned Studia Humanitatis, and an addition where the focus is not on a particular weltanschauung (paganus, Christian, liberal, or humanist) but rather on our shared pathei-mathos: on what we and others have learnt, and can learn, about our human φύσις from experience of grief, suffering, trauma, injustice. For it is such personal learning from experience, or the records of or the influence of the experiences of others, which is not only the essence of much of what we, and others for thousands of years, have appreciated and learned from some of the individual subjects or fields of learning that formed the basis for the aforementioned Studia Humanitatis – history, litterarum cognitio, and music, for example – but also what, at least in my view, provides us with perhaps the deepest, but most certainly with the most poignant, insight into our φύσις as human beings. Thus considered as an individual subject or field of learning, academic or otherwise, the culture of pathei-mathos would most certainly help to form and shape the manners, the character, the knowledge, of young people, for it has the potential to provide us with a perception and an understanding of the supra-personal unity – the mundus – of which we are a mortal part, and thus perhaps can aid us to become as inwardly balanced, as harmonious, as the unity beyond and encompassing us, bringing as such a perception, understanding, and balance, does that appreciation and empathic intuition of others which is compassion and aiding as such compassion does the cessation of the suffering that an unbalanced – a hubriatic, egoistical – human φύσις causes and has caused for so many millennia. But if we cannot make that or a similar personal journey; if we do not or cannot learn from our human culture of pathei-mathos, from the many thousands of years of such suffering as that culture documents and presents and remembers; if we no longer concern ourselves with de studiis humanitatis ac litterarum, then do we as a sentient species deserve to survive? For if we cannot so learn, cannot so change, cannot so educate ourselves, or are not so educated in such subjects, then it seems to me we may never be able to escape to the freedom and the natural evolution, the diversity, that await among the star-systems of our Galaxy. For what awaits us if we, the unlearned, stay unchanged, are only repetitions of the periodicity of human-caused suffering until such time as we exhaust, lay waste, make extinct, our cultures, our planet, and finally ourselves. And no other sentient life, elsewhere in the Cosmos, would mourn our demise. From a letter sent to a personal correspondent. Some footnotes have been added, post scriptum, in an effort to elucidate some parts of the text and provide appropriate references. I define the culture of pathei-mathos as the accumulated pathei-mathos of individuals, world-wide, over thousands of years, as (i) described in memoirs, aural stories, and historical accounts; as (ii) have inspired particular works of literature or poetry or drama; as (iii) expressed via non-verbal mediums such as music and Art, and as (iv) manifest in more recent times by ‘art-forms’ such as films and documentaries. The culture of pathei-mathos thus includes not only traditional accounts of, or accounts inspired by, personal pathei-mathos, old and modern – such as the With The Old Breed: At Peleliu and Okinawa by Eugene Sledge, One Day in the Life of Ivan Denisovich by Aleksandr Solzhenitsyn, and the poetry of people as diverse as Sappho and Sylvia Plath – but also works or art-forms inspired by such pathei-mathos, whether personal or otherwise, and whether factually presented or fictionalized. Hence films such as Monsieur Lazhar and Etz Limon may poignantly express something about our φύσις as human beings and thus form part of the culture of pathei-mathos. A pedantic aside: it is my considered opinion that the English term ‘balanced’ (a natural completeness, a natural equilibrium) is often a better translation of the classical Latin perfectus than the commonly accepted translation of ‘perfect’, given what the English word ‘perfect’ now imputes (as in, for example, ‘cannot be improved upon’), and given the association of the word ‘perfect’ with Christian theology and exegesis (as, for example, in suggesting a moral perfection). q.v. Bruni d’Arezzo, De Studiis et Litteris. Leipzig, 1496.